COUNTERINTUITIVE. 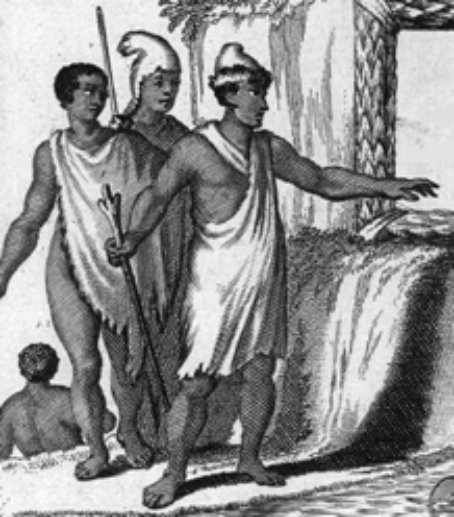 American Indians of the interior from an early map. The English in Virginia depicted native peoples as dark-skinned, muscular and statuesque with European features and curly hair. John Ogilby and Arnoldus Montanus, Virginiae partis australis et Floridae partis orientalis… (London, 1673). With DNA Consultants’ array of ancient DNA tests it is now possible for the first time to see if you match skeletons of real indigenous peoples of the Americas from archeological sites. Our Primeval DNA matches are based on one-on-one comparisons between your whole genome and the DNA of individuals who lived thousands of years ago, as reconstructed by genetic science. One of the offerings in our initial selection of available ancient DNA tests is Chumash Paleo-Indians. Primeval DNA was introduced on March 1 and is already producing genetic similarities that are pleasing and surprising to some customers and shocking and confusing to others. But that’s an effect that seems to be par for the course in a totally new learning curve. Since the simultaneous appearance of two groundbreaking articles last November—one in Cell by Cosimo Posth et al. of the Max Planck Institute in Germany and the other in Science by Victor Moreno-Mayar et al. of the University of Copenhagen—a sea-change has occurred in the study of American Indian DNA. Ancient DNA reveals very, very complicated histories in the peopling of the Americas. The single-entry crossing of the Bering land-bridge by a small group of Siberians, Clovis First arguments and other feeble attempts to simplify the genetic story of the New World are out of the window for good. The power of ancient DNA is clear. What remain are dedicated efforts to postulate the thousands of undocumented subsequent expansion, migration, back-migration, admixture, extinction, overlaying and replacement events before 1492. In this the consumer has a leading role to play along with the scientists. “The beauty of ancient DNA,” says Donald Yates, principal investigator of DNA Consultants and author of several books on American Indian history, “is that it speaks without filters or intervening theories.” There is no axe to grind, nothing to prove. It is simply there, evidence available for us to match or not match, like a forensic population result. Since 2015, nearly 2,000 ancient DNA peoples or cultures have been recovered and published. Among them now on a commercialized basis are Ancient Israelites, Medieval Vikings from Iceland, Stone Age Europeans, Ice Age Europeans, Egyptians Mummies, Ancient Britons from Roman Britain and Chumash Paleo-Indians. Fifty more are planned for the second phase of Primeval DNA.